As you know, this blog deals with topics relevant to the services I offer through Science Refinery. In addition to announcing deals and other news about the business, I cover things like grammar tips, the importance of editing, and other language miscellany. I’m considering starting another personal blog about a completely different subject (if and when I do, I’ll do a one-time cross-post here to let you know! 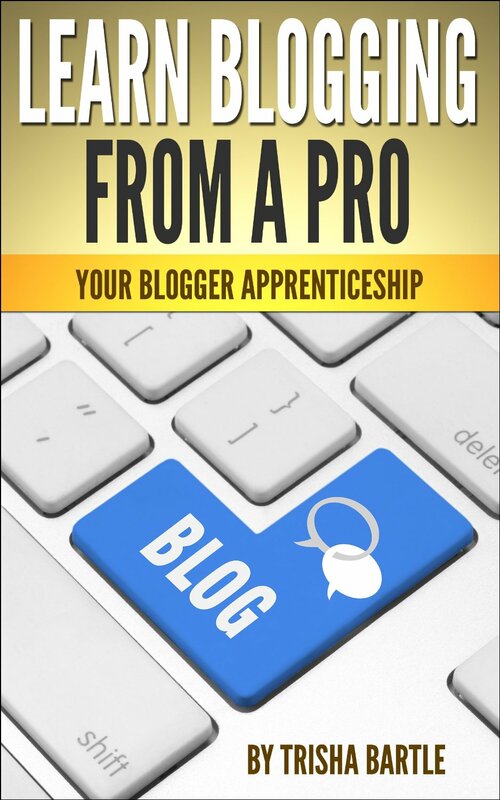 ), so yesterday I finally got around to reading Learn Blogging From a Pro: Your Blogger Apprenticeship. It’s an eBook that you can get from Amazon here. If you have Amazon Prime and an actual Kindle (rather than the Kindle app that you can install on other devices), you can borrow it from the lending library for free, but if you don’t meet either of those conditions, it’s only $4.99. Before I continue with my review, I just want to put it out there in the interest of full disclosure that the author, Trisha Bartle, is actually a friend of mine. I did find out about the book from her, but my review is my honest opinion and it’s not written differently just because I know her. Learn Blogging From a Pro does a great job of walking you through the process of starting a successful blog. It’s especially valuable for the novice, but those who are moderately familiar with blogging can learn a lot of new tips to improve their blog too. It covers everything, from naming your blog and choosing a host, to making the design stand out and reliably rocking the content, to increasing readership and making money off your blog. I really appreciated that Trisha injected lots of personality into the writing style–it was much more fun to read than other similar instructional manuals, which can be dry and boring. Finally, the resources guide at the end is a very useful collection of links. I’ll definitely be attempting to put more of the advice from Learn Blogging From a Pro to use on this site (and my potential new blog too, obviously). It’s well worth the $4.99. So what do you think of the book? Do you have other blogging advice resources to recommend? Let me know in the comments below! This entry was posted in Blog, Reviews & Recommendations on March 7, 2014 by Science Refinery (Lauren Meyer). Yesterday I got an email from someone at Easy WebContent about their new app Presenter. They were seeking a review here on the blog because they found my earlier post about Bunkr. Because there are many similarities between the two tools, I didn’t feel like writing a full review of Presenter. In case you’re interested, this review describes many of its features. You can view the entire (clickable!) infographic here. I’d love your feedback so I can improve if I ever decide to make another one. Presenter certainly is a powerful tool and it was fun to play around with. That said, I had to deal with a lot of bugs…or things that aren’t actually bugs but seem like they are because the correct functionality was non-intuitive for me. For example, objects and text would frequently re-size themselves seemingly at random; I eventually figured out that if I zoomed in to view my canvas at 100% then zoomed back out to my preferred 75% view, everything would be back to normal. Weird and super annoying. Another problem is that the infographic tools are not very flexible. For example, the percentage of Uranium-235 in mined ore is actually 0.7%, but it forced me to round to 1%. So while I don’t advocate flocking to Presenter (especially given how much I liked Bunkr), it might be worth poking around. If they fix some of my current gripes in future updates, I’ll be much more likely to enjoy the tool and take advantage of its unique features. So what do you think? Do you have experience with either of these programs? Which do you prefer and why? 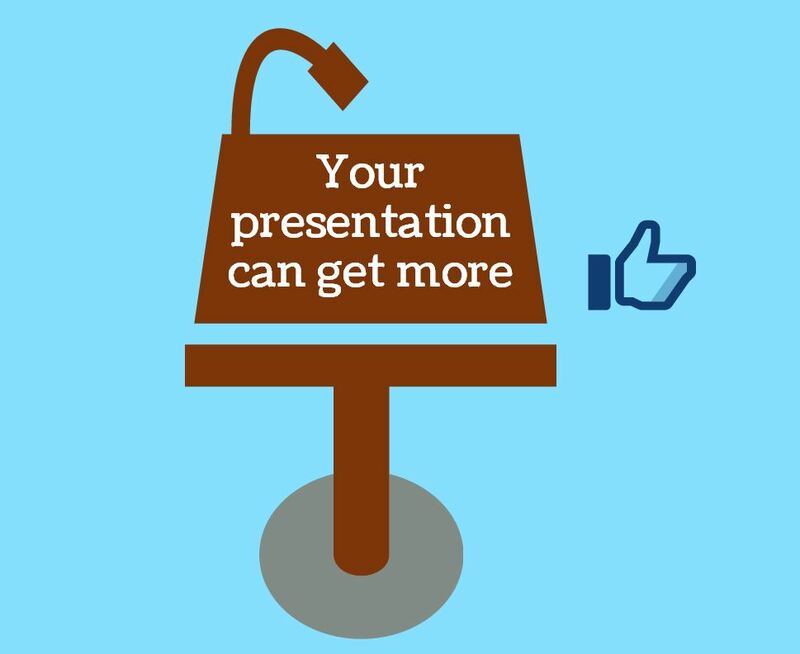 Or will you never abandon your beloved PowerPoint? Let us know in the comments. This entry was posted in Blog, Reviews & Recommendations on November 27, 2013 by Science Refinery (Lauren Meyer). The difference between the almost right word and the right word is really a large matter—’tis the difference between the lightning-bug and the lightning. 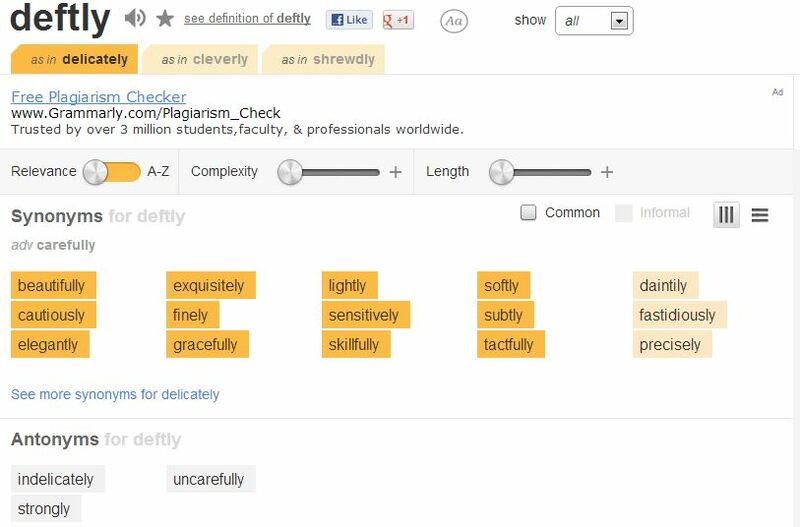 Thesaurus.com is now better equipped than ever to help you find that lightning word. 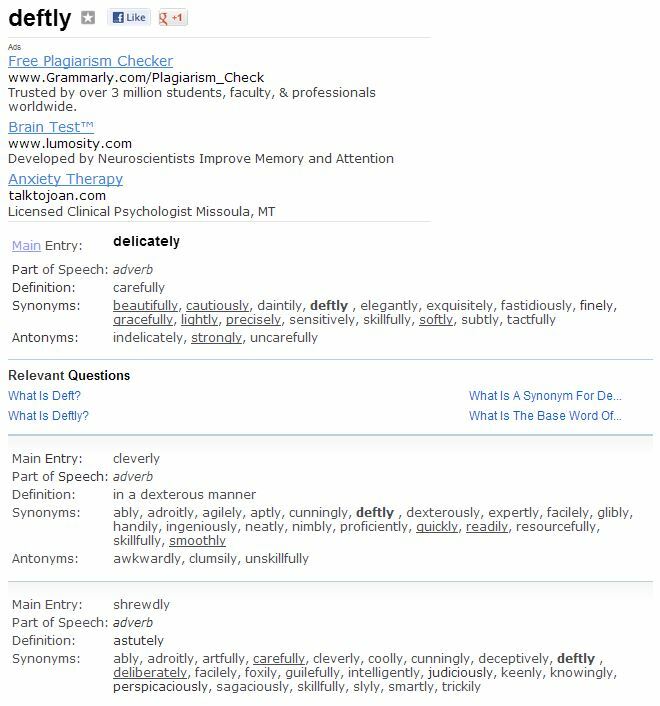 Entries are separated on different tabs so you can focus on the meaning you intend. You can sort by relevance (then alphabetically within a given level of relevance) so the most probable words are first. You can highlight only words of a certain complexity or length or those that are common or informal. The visually appealing column format makes skimming easier. My one complaint is you can’t use multiple highlighting options at once (for example, you can’t highlight words that are simple, short, common, and informal). Perhaps this will be addressed in future upgrades. I’m also curious about how complexity is measured. After testing a few words, I found some non-intuitive results with that option. Overall, these changes are very welcome. The new Thesaurus.com is better than ever, so there’s no excuse to settle for a lightning-bug word when you can find the perfect bolt of inspiration instead. *If you really miss it for some reason, you do still have the option to revert to the old version of the website. This entry was posted in Blog, Quotes, Reviews & Recommendations on November 26, 2013 by Science Refinery (Lauren Meyer). 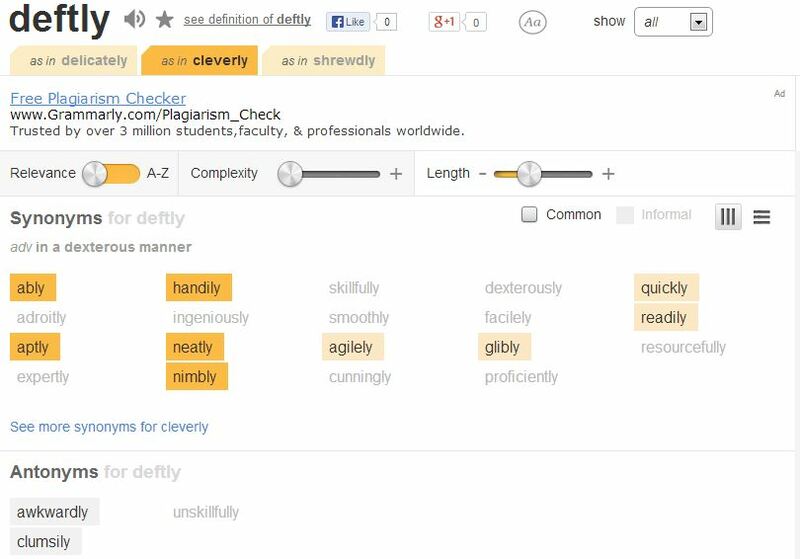 You’ve seen me use Google Ngram Viewer output before to make points about eggcorns, adverbs, and ingenuity. Earlier this month, the tool got a few welcome upgrades. You can now conduct case-insensitive searches, find all the inflections at once, and use wildcards. Check out these blog posts from Google’s research team and The Atlantic for more information and interesting examples of how to exploit these options. A few of mine follow. Case insensitivity: Now, instead of searching separately for aids, Aids, and AIDS, you can toggle back and forth between having them combined and separated. Inflections: Now, instead of searching separately for different verb tenses like run, running, ran, and runs, you can toggle back and forth between having them combined and separated. The same logic applies to adjectives like tall, taller, and tallest. Wildcards: Want to know which Kings are most often mentioned in books over time? Now you can, simply by adding a noun wildcard. I thoroughly recommend playing around with these new tools. Find anything interesting? Let us know in the comments below or on Facebook or Twitter! This entry was posted in Blog, Language Miscellany, Reviews & Recommendations on October 28, 2013 by Science Refinery (Lauren Meyer). Writing a research statement can be daunting. Whether you’re applying for a job, an award, or tenure, there’s usually a lot riding on the outcome. That’s why I recommend reading and saving this article by Drs. Gernsbacher and Devine in the latest APS Observer. They outline four tasks. I’ll copy a key sentence from each section here, but you really should read the whole article. It’s short yet packed with great advice. Task #1: Understand the Purpose of the Research Statement. Most problematic, treating your research statement as though it’s a narrated walk through your vita misses the primary purpose of the research statement, which is to make a persuasive case about the importance of your completed work and the excitement of your future trajectory. Task #2: Tell a Story. Although the five-paragraph persuasive essay format feels formulaic, it works. The Detective Story format is more difficult to write, but it’s more enjoyable to read. Task #3: Envision Each Audience. Some details are important, but an intelligent reader outside your area of study should be able to understand every word of your research statement. Task #4: Be Succinct. Consider three pages a maximum, and aim for two. All of these tasks actually apply to projects beyond research statements too. Understanding the purpose, telling a story, envisioning the audience, and being succinct are cornerstones of writing effective prose. This entry was posted in Blog, Reviews & Recommendations, Tips on October 7, 2013 by Science Refinery (Lauren Meyer). Malcom Gladwell, author of such popular science books as Blink, The Tipping Point, and now David and Goliath, is culturally influential. And that’s unfortunate. The super short explanation is that he makes strong, causal claims unwarranted by data. For the more elaborated version, I can’t recommend highly enough this article by psychology professor Christopher Chabris. It’s long, but definitely worth the read. But consider what Gladwell’s quote means. He is saying that if you understand his topics enough to see what he is doing wrong, then you are not the reader he wants. At a stroke he has said that anyone equipped to properly review his work should not be reading it. How convenient! Those who are left are only those who do not think the material is oversimplified. Who are those people? They are the readers who will take Gladwell’s laws, rules, and causal theories seriously; they will tweet them to the world, preach them to their underlings and colleagues, write them up in their own books and articles (David Brooks relied on Gladwell’s claims more than once in his last book), and let them infiltrate their own decision-making processes… It doesn’t matter if these are misreadings or imprecise readings of what Gladwell is saying in these books—they are common readings, and I think they are more common among exactly those readers Gladwell says are his audience. Please read Chabris’ piece and help give it the signal boost it deserves. This entry was posted in Blog, Miscellaneous, Reviews & Recommendations on October 5, 2013 by Science Refinery (Lauren Meyer).